Alexei Navalny's campaign: effective management or grassroots movement? Russia’s new wave of protest poses a question for those riding it: what kind of movement are they building? 12 June: a protest participant holds a placard "Corruption should become unseemly" at a rally in St Petersburg. (c) NurPhoto/SIPA USA/PA Images. All rights reserved.Today, when dozens of Russian citizens are still being held at police stations, the Investigative Committee is falsifying new criminal cases against protesters, and protest leader Alexei Navalny is preparing to spend 30 days in prison, it seems awkward to criticise him. But this awkwardness isn’t just about morality. Any critical remark risks pushing the author into the swamp of doubts, insults and speculations, in which sincere critics quickly become indistinguishable from the pessimistic and cynical comments made by Kremlin experts. So I’ll say it now: I was on Tverskaya Street in Moscow on Monday, and I don’t regret it at all. But it seems to me that right now — at this breakthrough moment for Russia’s protest movement — we need an honest public discussion about strategy. The night before 12 June, when thousands of people were preparing to participate in an anti-corruption protest on Moscow’s Sakharov Avenue, Alexei Navalny announced that he was going to radically change format of the demonstration. His supporters were left to believe him at his word. It’s telling that no one seriously discussed Navalny’s argument for changing the venue (sound and stage equipment couldn’t be found due to pressure on contractors). It was clear by default: this was a political move, and one aimed at intensifying the protest. Navalny is conducting a dialogue with the Russian authorities via force. In this context, a sanctioned demonstration — it doesn’t matter what sound equipment you have — doesn’t mean anything. In order to pressure the Kremlin into changing the established scenario of presidential elections in March 2018, he has to constantly raise the pressure — and the level of risk. Only by crossing the boundaries of the permissible can Navalny make himself heard and push against such boundaries, at least a little. The problem is, with Russia’s most prominent protest leader now entering this kind of dialogue with the authorities, how far will Navalny remain open to dialogue with the people who are taking to the streets to protest? Just as the slogan “For fair elections!” came to embody Russian society’s dissatisfaction in December 2011, today, Navalny’s presidential campaign (in the form of demonstrations against corruption) has catalysed protest across Russia. 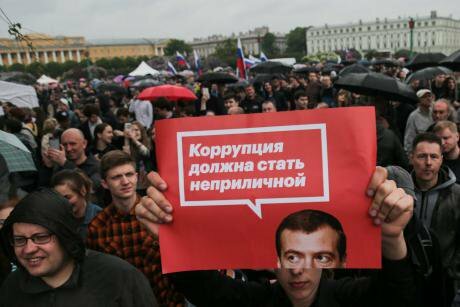 And just like the “fair elections” protests six years ago, the real agenda of protesters is far broader than getting Navalny’s name on the presidential ballot or even to make Prime Minister Dmitry Medvedev to address where his country house comes from. The real agenda — rising poverty, the state’s cruelty and lack of transparency, the never-ending stream of new taxes and cuts to social welfare — will bring more and more people out to protest. You can’t write these people directly into the ranks of Navalny supporters. They are of different views and different ages, but are members of pre-existing social movements. For instance, for people involved in initiative groups against the Moscow city “renovation”, the format of a sanctioned demonstration — where they can make connections and speak to one another — is far more useful than clashes with the police. What Navalny calls the “battle between good and neutrality” doesn’t happen in a vacuum, where there’s only the merciless authorities and the fearless leader of the opposition, but in society, at least a small section of which can still organise itself. The paradox of Russia’s current protest movement is that it has taken the form of a vertically organised election campaign, when it is, in essence, a broad coalition. This is a “political machine”, and one which is more like a commercial corporation than a political party, where rank-and-file members possess at least formal mechanisms of control over the actions of the leadership. Here, everyone has their own, strictly defined area of work: experts propose solutions, professionals bring them to the public, and the public is left to follow them. The only real justification for this kind of model is that it is effective: the protest wave is building, its geographical spread is constantly growing, and it’s becoming hard to silence it. Would this campaign be weaker if it made space for internal criticism? What if it made opportunities for horizontal discussion of Navalny’s programme and strategy? This management logic defines the politics of Navalny’s campaign: an effective team of young professionals throws down the gauntlet to the inflexible and corrupt party of power, which would definitely lose in a straight competition. In the same way, Navalny has already won the right to define the format of the next protest after competing with the rest of the Russian opposition, the majority of whom didn’t manage to reach the finish line like Navalny — some were imprisoned, some didn’t have the resources, and others lacked the patience and qualifications. It’s already easy to see how Russia’s growing protest movement is coming into conflict with the ethic of success and effectiveness that feeds the Navalny campaign. The future of the protest depends not on Moscow’s “creative class”, but the unemployed youth in the provinces, the public sector employees whose wages keep decreasing, the declining small business sector, impoverished pensioners and angry city dwellers. In effect, the protest will depend on everyone who believes they’ve lost out in the system that has developed over the past 17 years. This system, by the way, also isn’t averse to talking about efficiency and competition — for example, by cuts to hospitals and schools. This is why higher numbers of protesters turned out in Russia’s regional centres on 12 June, whereas in Moscow and Petersburg the numbers stayed at the level of the 26 March protest, if not lower. In order to reflect this evolution of the movement, Navalny’s campaign will have to change its rhetoric and structure one way or another. Indeed, though the campaign is shifting the focus of its rhetoric from Russia’s corrupt bureaucrats to the country’s oligarchs, from opaque state corporations to the lack of access to education and healthcare for ordinary citizens, then the campaign’s “effective management” structure will only be revised under pressure from below, when rank-and-file protesters demonstrate self-organisation and conscientiousness. After the events of 12 June, even the most devoted supporters of Navalny should stop and think: would this campaign be weaker if it made space for internal criticism? What if it made opportunities for horizontal discussion of Navalny’s programme and strategy? What if it transformed itself from a “political machine” managed by a few into a real coalition where political differences don’t impede participants, but help them come to an agreement about shared goals? This text originally appeared in Russian on Colta, a leading Russian platform for comment and discussion. Colta is funded by donations – find out how you can help here.